Thank you to everyone associated with Arbroath Football Club. 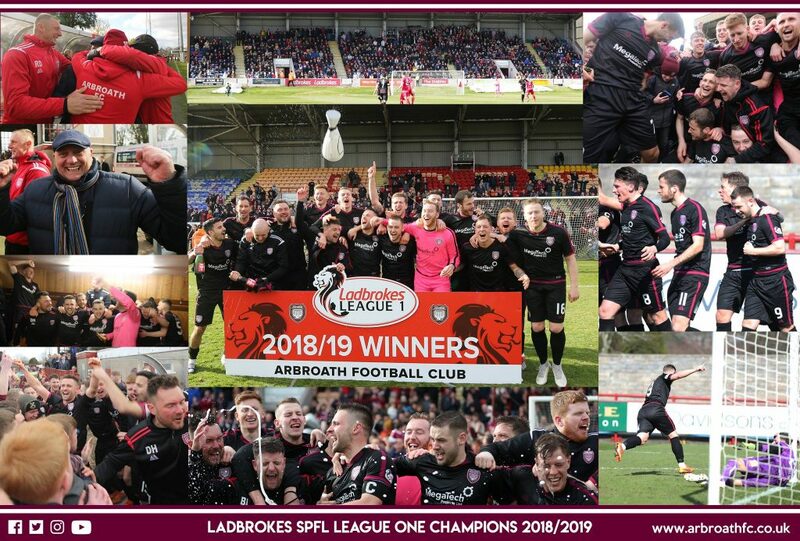 Yesterday at Glebe Park was yet another very special day in our club’s rich history when we won the Ladbrokes SPFL League One title for the very first time! A huge crowd of 1509 watched the game, with 1350-1400 Lichties filling the David H. Will stand along with our allotted spaces down both sides of the pitch. The game itself ended in a 1-1 draw with Ryan Wallace heading in a Colin Hamilton cross after just 5 minutes but Brechin City equalised when Michael Miller scored in the 22nd minute. Arbroath attacked for the majority of the second half but just couldn’t find the winning goal, however with only a point required celebrations began as Referee David Dickinson in the 95th minute with a pitch invasion of the Arbroath supporters running onto the pitch to celebrate with their heroes. It was a wonderful spectacle and all done in the most positive of manners with full support and permission by Brechin City and the stewards. The celebrations continued onto Gayfield and then out to Tutties Neuk, the Station Bar and Devitos! There are lots more photographs to come and many more notes of thanks but in the mean time – ENJOY!